Twenty years have passed since the salterio arrived in Queretaro México. 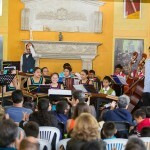 Now Queretaro, through the nonprofit Civil Association “Institute for Culture and the Arts and Music Education Pro”, presented the seventh international edition of the salterio festival in Queretaro “Que Viva el Salterio” in September 2015. With a new look, new music and new performers, it continues the tradition but is still evolving. International musicians of the dulcimer family from Austria and Slovakia worked with children and young people to present baroque period music, popular Mexican music with concerts for this instrument. Within this meeting all aspects related to the playing, building, history and the characteristics and potential of the salterio were addressed. For example there were presentations of CDs, lectures, presentation of the construction project of the salterio and presentation of the choir seniors Gracias a la Vida. There were premieres of works for this instrument by composers such as Horace Rico, Emmanuel Arias y Luna, Fausto Castelo, Eduardo Soto Millan, and Robert Morandell – an Austrian composer who joined this great team. “Que Viva el Salterio” is a contribution to education in Mexico. It celebrates national values in the field of artistic and cultural activity, without neglecting the high educational value of music in its various forms and manifestations, since the artist’s mission is to make society a work of art.